Around 1846, Henry Dalton, owner of Ranch San Francisquito, found two graves on hs property that were protected by a cactus hedge. He set aside two acres surrounding the graves for a cemetery. 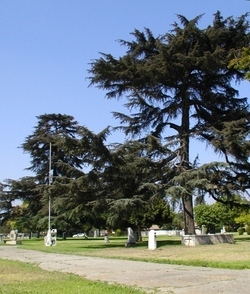 Savannah Memorial Park is possibly the oldest Protestant cemetery in Southern California and has been in continuous operation since its founding in 1850. Click here to visit the Savannah Memorial Park website. Click here for more information on the Savannah Memorial Park Cemetery on Find A Grave. Once you are there, you can enter a name in the search engine.